For my husband’s birthday, I surprised him with a trip to see his family in Missouri the week of Thanksgiving. 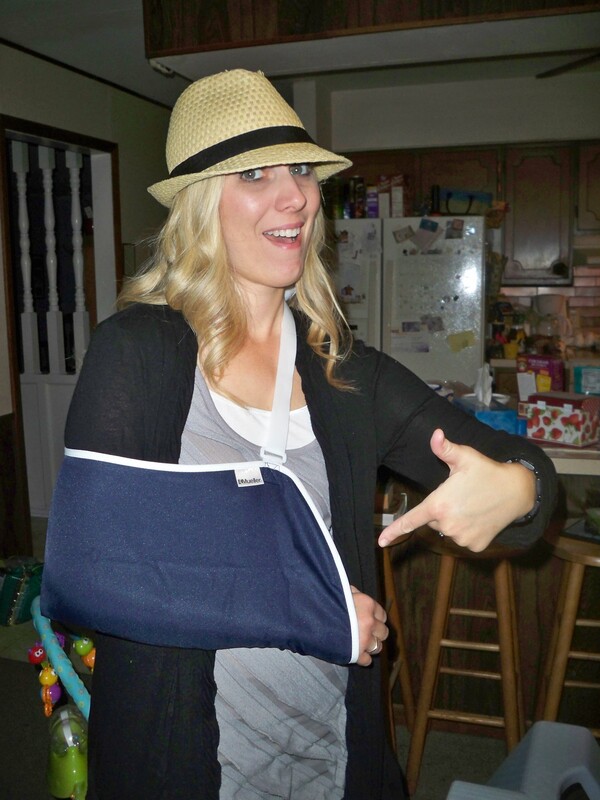 Three days into the trip (stayed seven days), I pulled my bicep tendon and was in excruciating pain. This meant my poor husband had to take care of me and the children while on vacation. Yes! He is a saint! Picture of me after a trip to Urgent Care in MO. Since my arm is injured, I am not going to write a new blog this week and save my strength. I hope you all had a wonderful Thanksgiving. There is much to be thankful for! I will keep you beautiful and supportive readers in my prayers! Note: CHRISTMAS SALE: My book, The Day I Died: Finding Hope in Suffering is selling for $11.00 at www.RefugeClothing.com. Great time to give it as a gift. It’s sold locally in AZ Bookstores, on Amazon, Nook, Kindle, etc. Check out more details at www.melaniepritchard.org! Please help me spread the word. I’ll write again in two weeks–praying my arm will be fully healed!! Melanie! Sorry to hear about your injury! I hope you had a great Thanksgiving! Guess what?! I live 20 min from Columbia!!!! I just finished your book in like 4 days! Thanks so much for writing it, because I know it inspired me! I’d love to meet you sometime when your in Missouri! Take care! God bless! Oh Melanie, I am so sorry! But only you could look so cute injured an after a trip to urgent care! I will pray for a fast recovery for you!